Sixteen CD and one DVD set by legendary New York rockers Blue Öyster Cult. 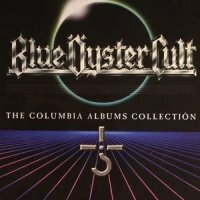 'Blue Öyster Cult' (1972), 'Tyranny And Mutation' (1973) and 'Secret Treaties' (1974) are exactly the same as the remasters from a few years ago, complete with the bonus tracks, and charts the progression of the band from their hippy-ish 60s beginnings as Soft White Underbelly and Stalk Forest Group to the 'thinking-man's heavy metal band', even though they were always far too tuneful for that title. They also show the progression in Murray Krugman and Sandy Pearlman's production work, with 'Secret Treaties' sounding particularly good and benefitting from some thoughtful arrangements and a better sounding rhythm section. The best cuts from the three albums were always superb played live, so a brand new remaster of the live double LP 'On Your Feet Or On Your Knees' (1975) is an excellent way to round out the band's formative years. The band's new-found pop-sensibilities and mainstream success of 'Agents Of Fortune' (1976) and 'Spectres' (1977) – with hit singles '(Don't Fear) The Reaper' and 'Godzilla' – are again the previously released remasters with bonus tracks, as is the live 'Some Enchanted Evening' (1978), complete with its seven bonus tracks and disappointingly dark live DVD. However, for most BOC fans it'll be the rest of the package that holds most interest, with new remasters of the remaining albums, albeit without bonus tracks. To try to take them to the next level they started to work with outside producers and write with some interesting outside writers, and for me it's the next sequence of albums that's perhaps the strongest, with the Tom Weman-produced 'Mirrors' (1979) and the Martin Birch-produced 'Cultosaurus Erectus' (1980) and 'Fire Of Unknown Origin' (1981), each featuring a sublime co-write with revered fantasy author Michael Moorcock for the outstanding tracks 'The Great Sun Jester', 'Black Blade' and 'Veteran Of The Psychic Wars'. All members wrote some standout tracks and 'Mirrors' and 'Fire..' in particular are maybe the pinnacle of the band's career along with the under-rated 'Spectres'. The first sign of a break in the strained relationship between drummer Albert Bouchard and the rest of the band happened during the recordings for the 'Extra-Terrestrial Live' (1982) double LP, with Bouchard appearing on just two tracks and drum tech Rick Downey taking over for the rest. Downey occupied the drumstool full-time for the 1983 opus 'The Revolution By Night', which I'd oddly dismissed for years as a two-track wonder (the Eric Bloom/Aldo Nova co-write 'Take Me Away' and Patti Smith/Donald Roeser song 'Shooting Shark'), only to re-assess it here as quite a strong album with a killer production job from the dearly departed Bruce Fairbairn. Lanier and Downey had departed by the time they recorded 'Club Ninja' in 1986, which despite a couple of dumb Bob Halligan Jr songs in 'Make Rock Not War' and 'Beat 'Em Up' (the same one recorded by Lee Aaron the previous year!) still had some interesting stuff. Coming to the end of their major label days, a complete about-turn saw both the Bouchard's and Allen Lanier return for the messy and cluttered concept album 'Imaginos', which had originally started life as an Albert Bouchard solo project and ended up being swamped by special guests and a host of badly arranged songs, including a re-recording of the 'Secret Treaties' classic 'Astronomy'. Here it sounds marginally better than the original CD but still far too busy for its own good. That's fourteen discs and the DVD accounted for, one of the other two are a disc of rarities, which includes the whole of the 1972 'Blue Öyster Cult Bootleg' EP, some Soft White Underbelly recordings that are previously released, some unreleased demos for the 'Teachers' movie soundtrack and a bunch of the best songs from 'Mirrors' played live, which sadly sound a bit thin. The other disc is a compilation of excellent-sounding live tracks from various radio broadcasts from between 1980 and 1986, but it's actually a bit redundant as there's a link provided to download the four whole concerts that these are taken from, and all are worth hearing even though I could happily live without three more versions of 'Roadhouse Blues' and 'Born To Be Wild'. The 1986 show is the most interesting one for me as it includes rarely played songs like 'White Flags', 'Take Me Away', 'Dancing In The Ruins', 'Wings Of Mercury' and the superb 'Shadow Warrior', but the 1980 one has a chunk of 'Cultosaurus Erectus' and that's cool too. All the discs are housed in replica cardboard sleeves so the box doesn't really take up that much space, and there's a nice booklet with a mini-biography and all the information about the records you will ever need. If you shop around online you can pick this up for under fifty quid, and for the lion's share of the band's discography (only the subsequent albums 'Heaven Forbid' and 'Curse Of The Hidden Mirror', poor live CD/DVD 'A Long Day's Night' and the 'Bad Channels' film soundtrack are the notable exceptions! ), that's quite a bargain.